To help you get acquainted with Bali, this is a very useful guide to all those first timers. 1. When is the best time to visit Bali? > In short, Bali is great all year round. The weather is always warm, tropical and best of all HOT. Temps are always between 26 – 30 degree celcius and they never dip below 25. Having said that, if you are heading off to the inland part of the island for some exploring like Ubud or the surrounding areas, then temps can get cooler as you are higher up in the mountain regions. > The dry season is from May till late September and it generally doesn’t rain during this period. However, there can be days where it does rain but this is an exception to the rule. The rainy season where you get tropical downpours that can last anywhere from hours to days is between Oct to late March. So bring a poncho or raincoat. > The peak tourist season is June, July and August as well as the usual peak holiday periods like Australia Day, Easter and Christmas. > In terms of villa pricing you will get better deals during the ‘off season’ (May and September) where discounts of up to 30%-50% are common – make sure you speak with our reservation team about the best villa deals during these months. Please also note that if you are coming to Bali during the religious day called Nyepi, nothing is open and no one is even allowed on the street. Essentially, you are villa/hotel bound and restricted as to where you can go. It is a very serious day so expect to hang in your room or by the pool the whole day without doing anything that involves outside activities or noisy events. What ever you do, do not under estimate the size of Bali it’s a very big island and many people are thrown by this. Each tourist area has it’s own unique personality, style and ambiance. Most of the tourists stay in the trendy Seminyak, Umalas, Oberoi or Legian areas while others looking for a more chilled out time will head off to Ubud, Sanur, Jimbaran Bay or Canggu. There are so many tourist pockets in Bali that you really need to know what’s right for you and what suites your holiday lifestyle. Following is a breakdown of the different tourist areas of Bali and what fabulous individual characteristics they have – make sure you choose the location that suits you best. 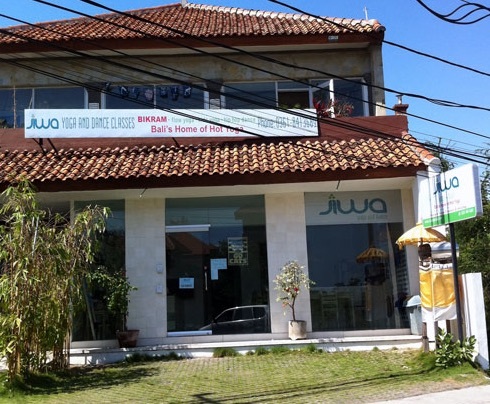 > Berawa: the very trendy area is part of Canggu but has it’s own very distinct character and charm. Here your going to find loads of new restaurants and cafes where most ex pats and tourists who have been to Bali before like to come and hang. 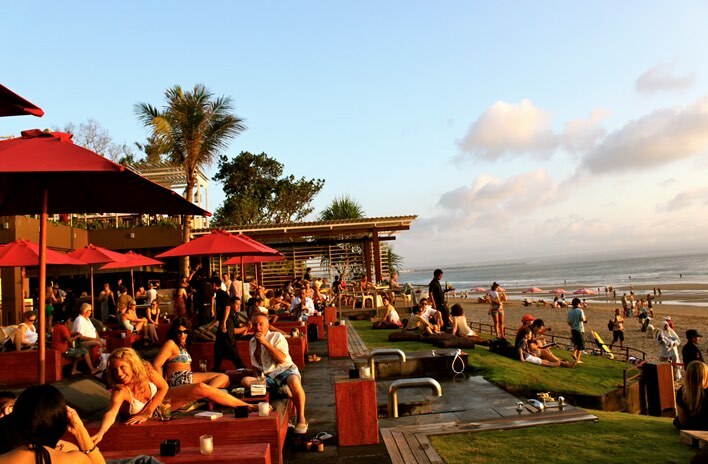 It’s right between Seminyak & Canggu so as you can imagine draws a very diverse crowd. The main thoroughfare is Jalan Pantai Berawa and this is where all the action is. It winds it’s way down to the beach. along the route it’s a foodies heaven. > Kuta: known for it’s shopping, local Balinese vendors selling souvenirs, large hotels, shopping malls and swarms of tourists who flock here, especially from Australia and the UK. It also is home to some serious all night clubs catering for the backpacker and twenty something market. This is where tourism all began in Bali and it’s loud, noisy and packed. Watch out for the traffic jams here as there are horrific. Kuta is definitely for the person who doesn’t mind being around loads of other tourists. One positive aspect of Kuta is that it is a beach side destination so most of the hotels are on the beach which is really handy. The area over the last couple of years has cleaned it’s act up and there are now some decent hotels here along the main Jalan Pantai Kuta. > Seminyak: this is where you will find most of the villas as well as all the top restaurants, really amazing cafes, day spas, clubs, high end shopping as well as the day clubs, surf shops (there are thousands of these throughout Bali) and all the uber cool/hip people. This is a non stop 24/7 area of Bali so expect there to be lots of action, crowds, traffic and people watching. Most of the accommodation in Seminyak is catered to the villa market which are all close to the famous Jalan Kayu Aya also known as Eat St. Most people will gravitate here at night as there are loads of restaurants here and some well known bars and clubs. It’s really the hub of tourism in Bali. > Umalas: Right next door to Seminyak but you really wouldn’t know it. A favoured area among ex pats Umalas is so much quieter & chilled out which is why it’s so popular. There are loads of new restaurants and cafes sprouting up every where you look and so are the new villa developments that want to capture this new eclectic vibe. It’s a mix between Balinese rustic village life and European chic. Most people often overlook Umalas as it’s a pathway between Seminyak and the popular Berawa area. Make no mistake, Umalas is about to boom. > Ubud: this is the cultural and some would say the spiritual heart of Bali and it’s set in the middle of the island about two hours drive from Seminyak. Arts, crafts, incredible rice field views, vegan cafes, cooking schools and yoga studios are all in Ubud – it’s where you come for some real peace and quiet and to absorb yourself in the rustic Balinese country side. It is actually really beautiful here and well worth visiting even for a day. > Uluwatu: Surf, surf and more surf – plus some incredible cliff top villas. Uluwatu is also known as ‘Ulus’ and is on the southern tip of the island. You really feel like you are in another world here as the cliff faces and fabulous coastal views make Uluwatu absolutely drop dead gorgeous. It’s almost has a bit of a laid- back ‘hippy’ vibe with some world class resorts, great cafes starting to pop up and stunning villas. If you planning to stay in Uluwatu be prepared to see some spectacular beaches and sunsets as this area is famous for both. > Canggu: People are now calling Canggu the new Seminyak as the hip/trendy crowd has migrated to the next area, which is only 10 min north in search of a more peaceful Balinese environment. Canggu is known for it’s great surfing beaches, hip cafes, family friendly holiday villas and gorgeous rice field views that you get from the villas. The main form of holiday accommodation is obviously villas as there is a lack of hotels in this area. Stay tuned I am sure they will follow soon. Canggu’s main shopping and restaurant strip is called Jalan Batu Bolong and the following video will give you a better idea of what it’s like. > Jimbaran Bay: this is a quieter beach area where you can escape the crazyness of Seminyak and Kuta and find a more quieter holiday environment. Jimbaran is famous for it’s seafood restaurants on the beach where scores of tourists all flock to at night for seafood meals and the fabulous sunset. Jimbaran is the gateway to the Bukit area of the island which makes it the perfect place to stay if you want to rent a villa here and go for day trips to places like Uluwatu, Sanur and Seminyak. Think of it as being in the centre of lots of popular areas. 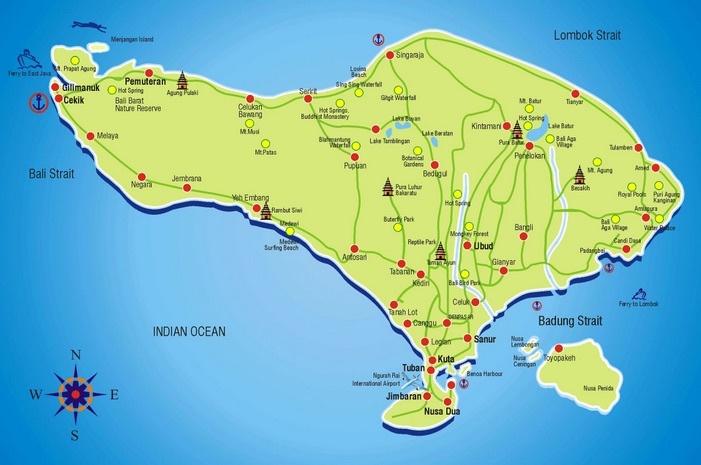 If you are coming to Bali for the very first time, we recommend that you start off in the southern part of the island and then start exploring from there. most of the villas we manage on this website are very close to Seminyak which means you get to sample the finest restaurants, shops, beaches and bars in and around the Seminyak, Petitenget, Batu Belig and Canggu areas. 4. Things to do in Bali for all those newbie’s. This topic could literally go on forever as the list is limitless. There is so much to see and do in Bali that most people will not even scratch the surface in terms of sightseeing. It really is best to limit it to a few things as you also want some down time where you can chill out and do nothing by your own private pool. 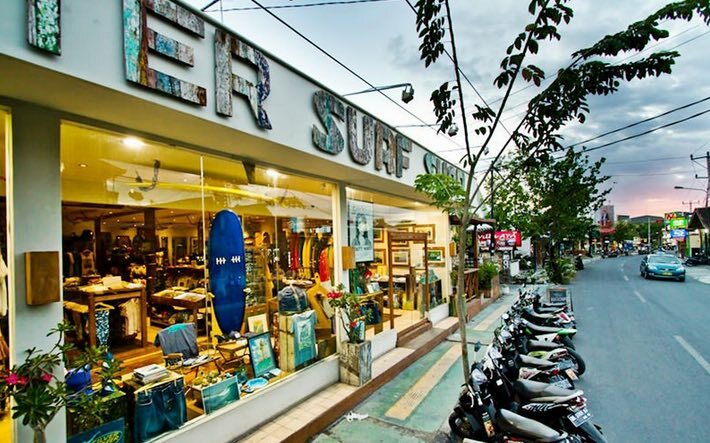 Lots of retail therapy – one thing about Bali is it’s a shoppers heaven. Start in Kuta and make your way down Jalan Legian to Seminyak and then head down Jalan Laksmana through to Petitenget & you will have hundreds of shops selling anything from local sarongs, surf wear, high end boutique women’s fashion, home wares, children’s clothing stores right through to Balinese souvenirs which are sold by local vendors keen to tap into the tourist market. It can take you days to do this and this will only be one part of the island. There is still other areas like Sanur, Ubud, Nusa Dua and Canggu which have their own pockets of shops for those starved of retail therapy & shopaholics. Take your credit card, you will need it. A tip here is to bargain hard but don’t over do it – remember you are paying in Rupiah so it’s still pretty cheap! If you like surfing Bali is a mecca – Surf breaks like Uluwatu, Bingin, Canggu, Nusa Dua, Padang, Keramas and Balian and all household names in the surfing community. Bring your board and go for it or if you prefer buy one here or even rent one. Surfing in Bali is fantastic so make sure you take advantage of this. If you are a surfer I am preaching to the converted here as you should already know about this. If it’s your first time and you’re a beginner then try easy breaks like; Tuban, Kuta or Batu Bolong ( try Old Man’s as it’s a really gentle wave) & Batu Belig which is in the Canggu area. Pamper your body and hit the day spas – there are some gorgeous day spas in all the main tourist areas that offer; massage, facials, reflexology, hair and make up as well as nails. In Bali you can choose the type of day spa according to your budget; from a cheap $5 massage on the beach, right through to day spas dotted along most of the main tourist roads to hi end spas that are famous world wide and are located in the 5 star resorts & hotels. You can even get a professional massage therapist to come around and give you an hour massage in your own private villa. Now that is decadent. The best day spas are in the southern part of the island as you can imagine, this is where most of the tourists are. Get lots of Balinese culture – head off to Ubud and explore the money forest which is well known & high on most tourists radar (where cheeky monkeys will do anything to steel your sun glasses so watch out and make sure you do not have anything loose hanging off you) or wander among the picturesque rice fields to see the farmers working the land. If you have seen the movie ‘Eat, Pray, Love’ you will have seen that this was filmed in Ubud where yoga and meditation featured so be prepared to recharge and re-energise your batteries here in Ubud. Ubud is famous for it’s cycling and trekking through the rice fields and typical Balinese villages so make sure you set some time aside for this. Learn yoga – there are hundreds if not more yoga schools and retreats throughout Bali, each with their discipline and practice. Bali is a top place to learn Yoga and if you are an experienced ‘yogie’ why not continue the practice in a new exciting place. Most of the yoga studios are in Seminyak and Ubud – all you need to do is Google the words ‘ yoga Bali’ and you will get a huge list. Personally our favourites are Jiwa Bikram yoga in Seminyak and The Practice in Canggu. Get ready for a huge work out here. See a traditional Balinese dance – if your not into visiting temples but want a tiny bit of culture then you must see a traditional Balinese dance. Your villa manager will be able to point you in the right direction – even better why not have them organise Balinese dancers to come to your villa and perform. This can be done and can be easily organised. Climb Mt Batur in the early hours of the morning to see the sunrise. There’s also Mt Agung which is an active volcano so you can put this on your bucket list as not many people can say that they have scaled an active volcano. Make sure you have a reasonable level of fitness before attempting this. 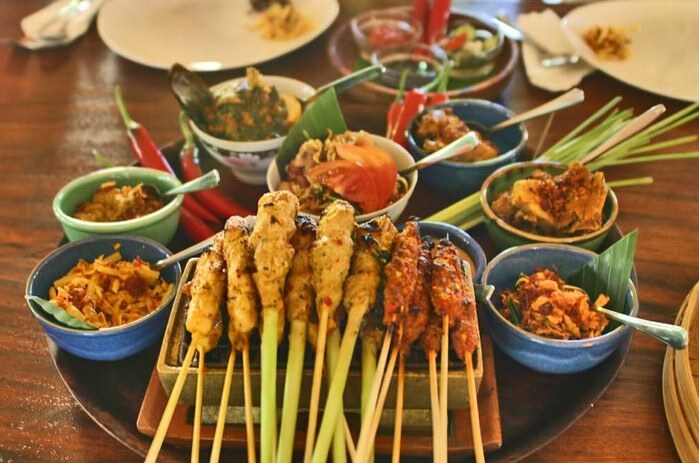 Learn how to cook Balinese and Indonesian food by taking a cooking class in Bali. If you love Nasi Goreng and sate you will enjoy learning how to cook these scrumptious dishes and best of all you get to eat them. There are tons of cooking classes all over Bali. Again, ask your villa manager. 5. Forget any crash diets – Bali is all about food and lots of it. When your on holiday just go for it, especially in Bali where there are so many fantastic restaurants selling local and western style food. Bali is a foodies paradise and everywhere you look there is at least 1 restaurant or local warung. Food prices are incredibly cheap here and you can have a 3 course dinner for 2 people for less than $20. 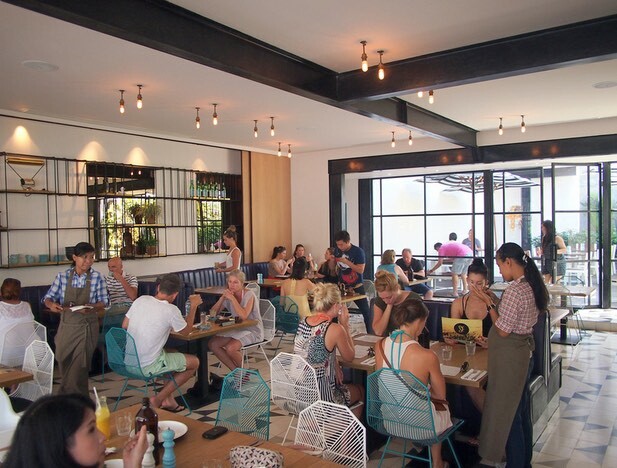 Having said that, there are other places where you can spend an absolute fortune eating out – most tourists go middle of the road and hit some of the many famous restaurants in Seminyak’s Eat Street, Legian, Canggu, Kuta and Peitienget. 4) Betelnut in Canggu and I just want to throw in Crate and Monsieur Spoon as well. 10) lastly a meal prepared for you in your own villa – nothing really beats this, especially if you are in one of our fabulous, luxurious villas. The staff will be more than happy to go shopping for the ingredients and prepare a fab meal for you and the kids. There are lots of vegetarian restaurants and even the ones that aren’t will have great vegetarian dishes on the menu. If your looking for halal restaurants well, Indonesia is the largest Muslim country in the world so there’s no shortage here. If you have any special dietary requirements, the Balinese waiters are very patient and will do their very best to accommodate your needs. There are tons of quirky, cool little cafes where you can watch the world go by. All you have to do is start exploring your local area. If your travelling to Bali on a limited budget go for the local warungs – these are clean and in 99.99% of places the food is fine – same as back home here in Australia. Bali restaurants place a lot of emphasis on local, organic fresh produce so you know that you are getting fresh meat, chicken, fruit and veggies daily. 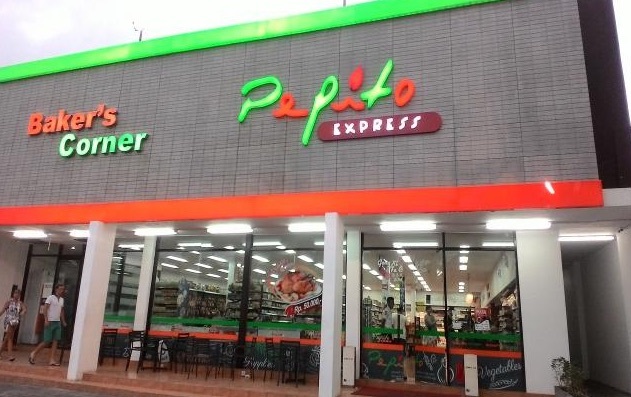 There are many many super markets such as Popular, Pepito and Nirmala where you can stock up on food. There’s one literally every couple of hundred metres or so. Plus there are thousands of 7-11’s and Circle K convenience stores that sell lots of smaller items and junk food – same as back home. > The local beer is called Bintang and it comes in 2 sizes; small and large and costs Rp 5000 for a small and Rp 10 000 for a large – that’s 50 cents and a dollar! Be careful and only use reputable money changes either at the airport or in larger stores – never be enticed by someone on the street to change money. Be really careful here as predators are on the look out for suckers. A good tip is and pay close attention to this – it’s better to change money in Bali NOT at home as you get a far better exchange rate of up to 20-30% more if you do it in Bali. Also there are heaps of ATM’s everywhere so you really don’t have to bring that much cash with you. Don’t stress about finding ATM’s as there are heaps of them everywhere, even in most convenience stores. 7. How much money do I need in Bali? That depends on your budget and holiday lifestyle BUT here is a rough breakdown. Note: this does not include accommodation or flights. >Budget Travellers. If you eat in cheap local Balinese warungs and spend your days n the beach doing little shopping and not much else then you can squeeze by on $15-$25 per day. This includes the occasional massage on the beach ( you would have to bargain a bit for this I’m afraid) and the odd Bintang or 2. Not much fun, but great for those wanting to keep it low key in Bali. >If you like a bit of luxury. A good budget for this is about $100 per day and you can really have some fun here. Eat out basically wherever you like and enjoy your daily massage at a pretty good day spa. You could also rent a scooter to look around the island (if you hate the thought of renting a motor bike then this budget would allow you to get taxis everywhere) and enjoy a bit of nightlife as well with a few cocktails. This is a good family budget where $100 would be per person – this would allow a good holiday budget. You probably won’t even spend that much and like most people you will have a handful of Indonesian currency when you leave. >Unlimited funds. Well, you can spend big time in Bali if you like. Stay in a beach front luxury villa. You can shop at high end luxury boutiques and dine at world class 5 star restaurants where international chefs cook. Bring your credit card and have a fabulous time. 8.What to pack for your Bali holiday. The tip here is to pack light. While it might be cold from your departure city and you might be tempted to pack the extra jumper, don’t do it. It’s a waste of space. Bali gets hot and I mean real hot and very humid. You won’t need any type of winter clothing. Pack light t shirts, board shorts, singlets and thongs. Also take a pair of good walking shoes as you will need these. Remember pack light as you will wear minimal clothing during the day. If you are planning to go out at night to some nice restaurants then the dress is always smart/casual – nothing over the top as you will look out of place. Bali is very chilled out and your attire should reflect this. Also take, mosquito repellent as well as diarrhea and vomit tablets as you may need these. Having said that there are heaps of chemists all over Bali and if you get sick you can always duck into a local 7-11 to pick up these necessities. 9. Need to know gadgets. Bali’s electricity is not the same as Australia and you will need an adaptor. Most of our villas will have these but for the sake of $10 pick one up at the airport before you leave. Wifi is getting better in Bali and most of the villas have really great Wifi with minimal drop out. So if you are coming to Bali and want to stay connected you can. Also, nearly all the restaurants and bars have Wifi so you are pretty much certain to stay connected where ever you go. In terms of mobile phones, coverage is really good and I know that Vodafone has a great deal where you can speak to Australia and make as many calls as you like and talk for as long as you want for only $5 per day – this is a really good deal especially if you want to do some work while away. This is easy as there are taxis all over the place. Make sure you use a metred taxi and NOT a taxi where they tell you the price – this is a rip off. Bluebird taxis are the best and most reliable. If you are leaving your villa our staff will orgnise a taxi for you and take you anywhere you want to go. Make sure you have the address of the villa written down for your return journey. You might also like to rent a motor scooter for about $5 per day. 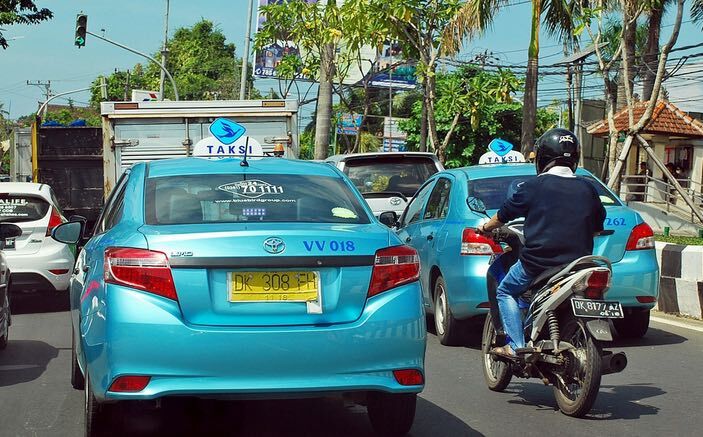 This is really common and a great idea but it does come with a huge warning – BE really careful as the driving laws in Bali are not regulated and it’s chaos on the roads. Probably the best thing to do if you are coming to Bali as a family and want to tour the island or go somewhere is to organise a driver for the day. This costs about Rp 500 000 or $50 and you get a mini van ( with air conditioning) with a driver for roughly 8 hours – this is such good value and most families end up getting a driver for their entire stay. We can also organise this for you before you arrive in Bali. Walking anywhere on the roads in Bali (except the main tourist areas) is not advisable as drivers tend to make up the rules as they go and accidents do happen frequently. Best to get a taxi or a driver – a lot safer for everyone. drink from the tap – always from bottled water and never rinse your mouth out when brushing your teeth with the tap water – you will cop the Bali belly! do drugs – this may be offered to you but what ever happens just walk or run away – this is not a joke and to even try them at a club or bar is seriously risky!!!! don’t eat street food like Bakso from the carts. They are everywhere. As tempting as this might be your more than likely to get the Bali Belly if you do. wear a helmet when driving a scooter – the police are on the look out for this especially foreigners where thy can extort a bride from you. Now you are armed with all this information go and enjoy yourself on this amazing, fantastic island!